The photos are beautiful! Were you wearing the same colour tartan - I couldn't tell from the black and white photo. It all looked so stunning and happy. Congratulations to you and your son! I got teary-eyed. Sweet photos. I got teary eyed too. Besides approving from a personal taste level of the gold and purple color scheme, the glorious flowers, gorgeous gown and blown me away kilts, I just love seeing a wedding that is such a self expression of the people involved. Amazing. Well done, not just for making such amazing clothes but for making such a wonderful son! Lovely natural perfect wedding! You kilts are spectacular and you did a great job on all the garments. (I loves me a man in a kilt!) Congrats to you, your son and new daughter-in-law! Very nice pictures and wonderful kilts. You are right there is something to handmade garments that can't be had off the rack. What lovely photos! Your kilts are amazing- well done! I am soooooooooo impressed. Your talent is amazing !!! It is great to see the finished kilts being worn, and at such a beautiful event too. Absolutely astounding. I am so impressed, but not at all surprised to see such fabulous workmanship. And the wedding! What glories to share! Thank you! What a glorious day it looks to have been!! Beautiful weather too! Congratulations! 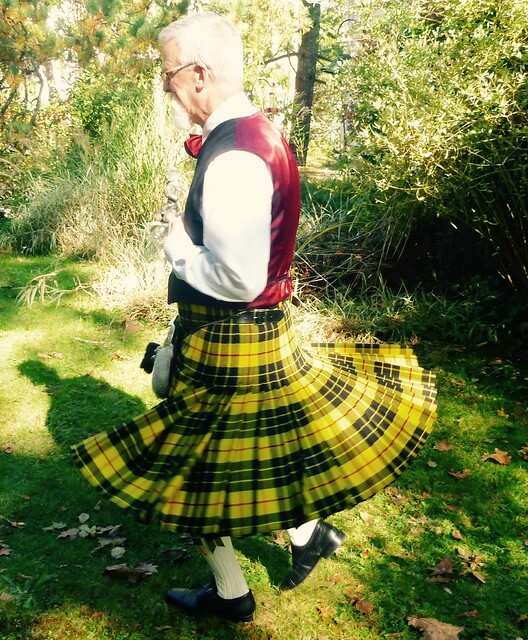 Awesome kilt and wedding. Congratulations to all. What a beautiful couple and wedding! Those photos really capture a truly glorious mood. All the colors are so spectacular. The kilts are amazing, and what an honor and memory you'll (father and son) have for a lifetime! Thank you for sharing! Congrats to the newlyweds! Thanks for sharing photos of that beautiful wedding! And the kilts are amazing!! Congratulations to the Bride and Groom they created their perfect wedding day and the kilts will be such an amazing thread between you and your son forever. Amazing craftsmanship. What a beautiful couple and wedding! Beautiful! Best wishes to your son and daughter-in-law! Kilt = INCREDIBLE. What a gorgeous wedding. Congratulations to your family!